HONG KONG, April 9, 2018 /PRNewswire/ — Representatives of SilkChain, a leading global digital free-trade blockchain project, met investors to discuss the future of ledger technology along with other plans involving high encryption as part of an all-China blockchain roadshow, sponsored by KG.com and btc123.com, in Hong Kong. 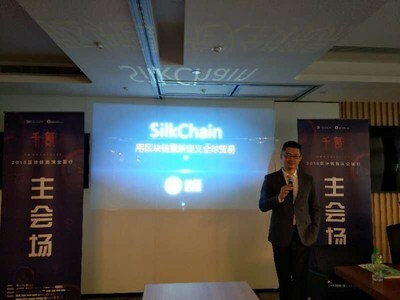 Leaders at SilkChain had a face-to-face discussion with investors in the Asian financial hub on how to apply the new and advanced technology in the real economy to aid and upgrade regional economic restructuring. SilkChain established a strategic partnership with AL-MOBTY Group in the United Arab Emirates, Dragon City in Bahrain as part of its regional expansion in February 2018. A blockchain ledger records transactions between parties in a verifiable, secure, permanent and efficient way. “SilkChain will work hand in hand with cross-border e-commerce B2B platform DinoRiver (OSell World) to promote the adoption of blockchain technology in international trade, with the aim of setting up a decentralized global digital free-trade zone,” CEO of DinoRiver (OSell World), which is also one of the founder institutions of ITDC Yi Qing said at the event, which was co-sponsored by Cointime, jgy.com and Dolphin Blockchain. Other participants at the roadshow included Sha He, a blockchain expert at China Electronic Commerce Association, and Waishun Lo, co-founder of DL Capital and professor of the Chinese University of Hong Kong (CUHK). Their conversations focused on joint efforts to explore future opportunities presented by blockchain technology, which safeguards security. SilkChain’s vision is to eventually foster a global trade ecosystem where all players in the value chain can cooperate in a free, seamless and friction-free manner, based on the principles of decentralization, openness and mutual benefit. SilkChain, developed by ITDC, is the world’s first blockchain project dedicated to improving international trade. The project has gathered world-leading business groups, trading companies, e-commerce companies and logistics, warehousing and finance companies from around the world with the vision of creating a decentralized, open, transparent and trusted “Global Blockchain Free-Trade Zone”. With the ancient Silk Road as its model, ITDC named this digital network SilkChain.